“There is a gap between what was promised and what is being presented today,” said Mr Juncker. “If we accepted the slip, some European countries would cover us with insults and tirades with the accusation we are being too flexible with Italy,” Juncker told Italian media. In reference to the festering acrimony between EU bureaucrats and populist Italian leaders, who have even threatened to sue Juncker for jawboning Italian bond yields, the European Commissioner said speculation that he’s somehow “against Italians” is “rubbish”. “They attack me, insult me but do not ask questions. Let’s stop saying that I am against Italy. It’s rubbish, it’s a lie,” said Mr Juncker. Italian Prime Minister Giuseppe Conte is set to address EU leaders at a summit in Brussels on Thursday, despite fears that he might hijack the summit’s agenda, which leaders have hoped would focus on finalizing a draft Brexit deal. But while some EU leaders have pushed to give Italy a pass, fearful of provoking an EU “showdown,” Juncker has continued to insist that the EU must abide by its rules. Conte and Tria are expected to address Italian lawmakers Tuesday afternoon Rome time. Officials are fearful the mini eurozone summit could become a flashpoint between Rome and the EU if hawkish governments such as the Netherlands demand Mr Conte stick to Rome’s budget commitments. A senior EU official warned against an EU showdown. 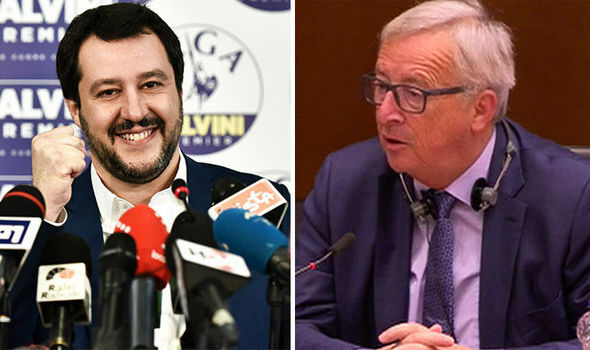 Mr Juncker insisted the assessment would be made without any “prejudice” against Italy’s Eurosceptic coalition government, made up of the rightwing League and anti-establishment Five Star parties. “Europe operates according to pre-established rules. Incoming governments must respect the word of those who preceded them,” he said. As speculation about an ‘Italeave’ scenario has continued to fester as the budget showdown has dragged on, one reporter asked Juncker if he felt that European Union could survive an Italian exit. Citing polling data showing that most Italians favor remaining in the EU, Juncker insisted that the EU wouldn’t survive the departure of its third-largest economy – and that Italy wouldn’t survive an exit from the EU. “Europe needs Italy and Italy needs Europe,” Juncker said, answering “No” when asked if Europe could survive an Italian exit. But will this in any way shift Brussels’ evaluation of the Italian budget? We think not. Still, we imagine markets will be ‘disappointed’ when Brussels sends the draft back covered in red ink.